Sunday, aerial firefighters working on the Rice Ridge Fire were forced to ground their planes after a drone was spotted flying over the fire. This is the third time this summer that drones have interfered with firefighting on the Lolo National Forest. When fire managers begin using air support to suppress a fire, they set up what’s called a Temporary Flight Restriction, or TFR. The TFR bans any aircraft NOT associated with firefighting from the airspace to give pilots some space to do bucket scoops and retardant drops. If a drone does breeze through, all that has to stop, says Erin Fryer, a public information officer on the Rice Ridge Fire. "And so helicopters would go back to their helibase, air attack ends up going back to Helena where they're stationed right now." 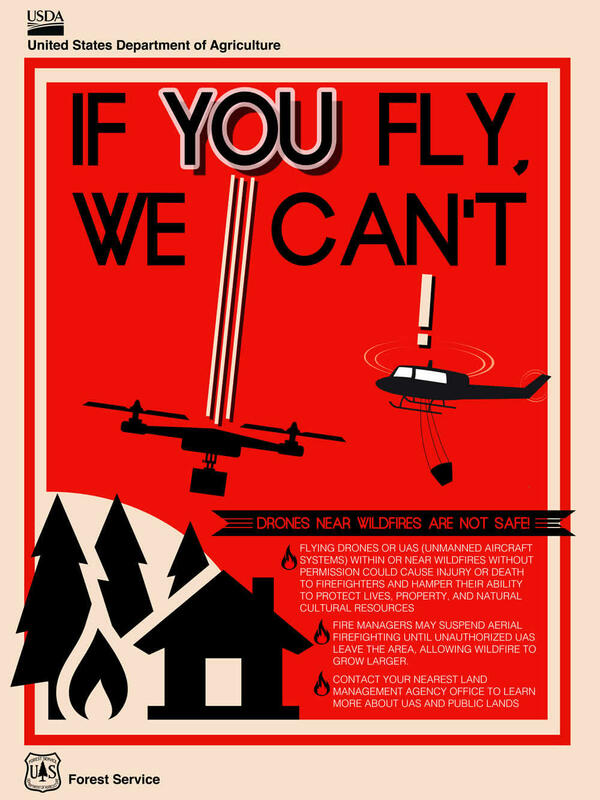 Be smart, don't fly your drone anywhere near a wildfire. No amount of video or photos are worth the consequences. Firefighters on the ground Sunday night continued to secure fireline and made some progress despite active fire conditions. "But when the fire is getting up and moving, and moving fast, it's hard for them to stay ahead of it and take care of those hotspots," Fryer says. In addition to losing a sorely needed resource, Fryer says this kind of thing weighs on firefighters and the community they’re trying to protect alike. "Losing that capability of that air support is a huge impact to the firefighters, and it's pretty frustrating and defeating … it's a really unfair impact to our communities to have those operations shut down or hampered because of one person's choice." This kind of interruption has happened twice on the Rice Ridge Fire and once on the Lolo Peak Fire. All three incidents are currently under federal investigation. Nationwide, there have been at least 20 cases of drones interrupting firefighting activities this season. That’s according to Jessica Gardetto, spokesperson for the National Interagency Fire Center in Boise, Idaho. "We've had numerous close calls where a drone has come within 50 to 100 feet of a helicopter or an air tanker, and as I mentioned before, that can cause a collision and cause it to crash," Gardetto says. There are a few layers of federal regulations that prohibit flying drones and other unmanned aircraft systems into active firefighting operations, but the Federal Aviation Administration is the main agency to handle these cases. If an investigator can prove the flight was intentional, the FAA can prosecute to the tune of $20,000. Gardetto says some states have laws even more stringent than federal regulations to protect firefighting pilots and keep air suppression moving. "These wildfires grow at a rapid pace, so every hour, every minute that those air tankers and those helicopters are working, counts. So it can have severe impacts on wildfires if they do have to shut down for even an hour or two." The onus is on the drone operator to know where temporary flight restrictions are in place. A map of no-fly zones is available here. The drone pilot allegedly responsible for temporarily shutting down aerial firefighting operations on the Rice Ridge Fire near Seeley Lake Wednesday is now the subject of a federal investigation. The U.S. Forest Service is working in conjunction with the Federal Aviation Administration and U.S. Department of Justice to determine if charges are warranted. Aerial firefighting operations on the Rice Ridge Fire near Seeley Lake had to be shut down for a few minutes today due to a civilian drone. This fire season there have already been more than 18 public drone incursions, most of which resulted in the temporary shutdown of aerial firefighting efforts.